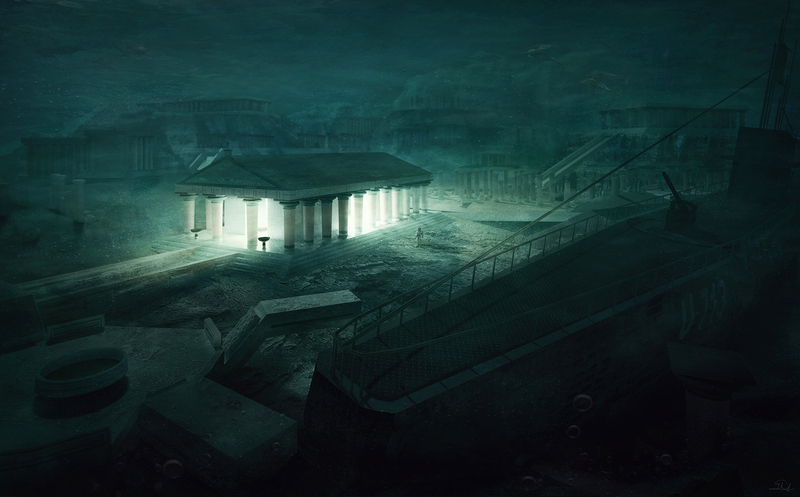 Concept art based on ‘The Temple‘, H.P. Lovecraft’s short story. What I did see was not spectacular, not grotesque or terrifying, yet it removed my last vestige of trust in my consciousness. For the door and windows of the undersea temple hewn from the rocky hill were vividly aglow with a flickering radiance, as from a mighty altar-flame far within. As I stared at the uncannily lighted door and windows, I became subject to the most extravagant visions—visions so extravagant that I cannot even relate them. I fancied that I discerned objects in the temple—objects both stationary and moving—and seemed to hear again the unreal chant that had floated to me when first I awaked.” – The Temple, H. P. Lovecraft.